Julian Weigl made his first start of the season, after not being 100% for the first matchday, and joined Rode in the defensive midfield position. With his spot taken up, Gonzalo Castro moved to the right wing position and Ousmane Dembélé dropped to the bench. Felix Passlack was also to be seen in the dugout as Piszczek reclaimed his spot on the right of the defensive line. Leipzig saw one change from their 2-2 draw at Hoffenheim, with Benno Schmitz dropping out for Lukas Klostermann in the right-back position. In anticipation of the match, the biggest talking point was whether Dortmund would be able to overcome the defensive pressure of Leipzig. After losing Gündogan, Hummels and Mkhitaryan over the summer, the visitors had lost significant individual and collective pressing-resistance, which showed in their less-than-comfortable win over Mainz. In Leipzig, their opponents on the second matchday are amongst the most intensely-defending teams in Germany, proving a great challenge for the new-look squad. As ever, Leipzig were structured in their 4-2-2-2 shape with Sabitzer and Kaiser both acting in their respective half-spaces, between the lines of central midfielders and strikers. When Dortmund had more stability in their possession, Leipzig would revert into more of a mid-block, which would bring more of a 4-4-2 shape. However even in this shape, the ball-far midfielder would shift up in order to occupy a better position to press any switches, and have access into the attacking midfield spot. Even from a 4-4-2, Leizpig would stagger the midfield to support their pressing. With almost-always at least four lines in their shape, Leipzig’s structure is very much conducive to their pressing game. The three banks of two allows a natural staggering to develop, with a good number of players occupying different heights on the field. The effects of this are highly beneficial, as not only does it help increase the coverage of space within the structure, but it can lead to more effective pressing movements and shapes. The additional lines of players translates into more waves of defenders which Dortmund need to break through to advance the ball into attack. Another consequence of this shape is a high level of horizontal compactness. With Sabitzer and Kaiser inside, the shape is generally spread between the half-spaces as they focus on covering the three central columns effectively. Defending in a zonally-based block, the shape was very rarely stretched and could instead stop Dortmund from playing through the centre of the pitch. In their pressing, the intensity and execution of the movements were extremely impressive. Their ball-oriented shifts when Dortmund passed laterally were excellent, allowing them to immediately pressure the recipient on the touchline in just one of their many trap variations. The coordination of the movements were strong as they stayed connected whilst moving up to close the opponents down, maintaining ball-local compactness. 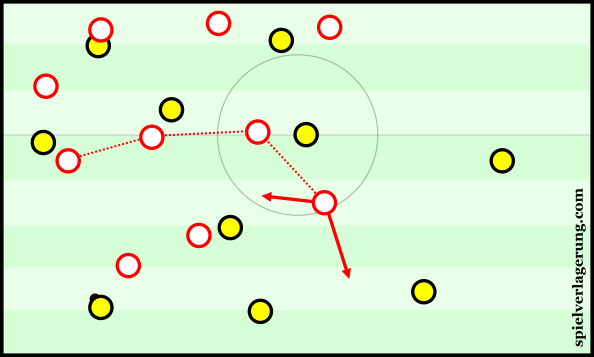 Through the fast and accurate nature of their defensive shifts, they stopped Dortmund from exposing their ball-orientation through switches and similar actions. Regardless of the overall strategy, an important factor for any team in beating Dortmund is the shutting-down of Julian Weigl. There is a large argument that the 21-year-old pivot is their key player this year, with his intelligent movement and pressing-resistance crucial for their possession game. Therefore, it was unsurprising to see that Leipzig, one of the most intelligent sides in Germany, had done their homework as they covered him well. Both strikers often stayed close to the defensive midfielder, using their cover shadows well to block passes whilst the collective compactness helped to restrict his space also. The pivot was often covered specifically by the moving-up of Stefan Ilsanker in addition to the shadowing of the two forwards. Man-orientations were to be seen in other areas too as is so commonly done against Dortmund. They forced a number of aggressive duels which suited the strategy of the home side, who exposed an opponent who unsurprisingly still misses the calming presence of Ilkay Gündogan. Such an approach to defending is designed to make any team uncomfortable on the ball. Aside from the centre-backs and goalkeeper, no Dortmund player had the time or space on the ball to comfortably execute a pass or dribble. Leipzig made the midfield spaces extremely tight and forced almost immediate decision making for the visitors. As a result, it was no surprise to see Tuchel’s team struggle. A number of the squad are still developing a familiarity with their teammates, and understanding is at a limited level making such fast-thinking difficult. Moreover, the extremity of Leipzig’s game forced Dortmund to change their playing style quite dramatically which, for a team still grasping Tuchel’s plan A, made it difficult for the away side. The most interesting element of Dortmund’s game, was the movements and resulting structure of their players during the build-up phase. To break through the Leizpig press, Tuchel will have had to procure something special and although it didn’t work, it was an interesting sight. From a position on the right of defensive midfield, Sebastian Rode made diagonal dropping movements into a right half-back position, creating a back-three with the centre-backs. Lukasz Piszczek would move higher down the right side and Weigl would shift slightly more centrally, as a lone pivot. Dortmund’s unusual structure in build-up. The additional man in the 1st line of players gave greater security against the Leipzig pressing and could theoretically allow them to outnumber the front two of the home side. An extra man in the defensive line could almost be somewhat of a necessity against a team such as Leizpig, as a two vs. two against their strikers would give them the impetus to press more aggressively. In a similar fashion, it gave the visitors a greater security in the event that they lost possession, simply with an extra man behind the ball to try and prevent any dangerous chances on the counter-attack. Through Rode dropping, it also allowed Dortmund to keep Weigl in the midfield areas. The more pressing-resistant midfielder is better-suited to such situations in comparison to Rode who doesn’t possess the same quality when under pressure. However, it was somewhat of an off-day for Weigl, who uncharacteristically made a number of heavy touches in the middle. After the 30 minute mark, Tuchel adapted his side somewhat, and Rode acted less as a clear half-back during build-up. Although he had the licence to shift into this position when the situation required, he also stayed alongside Weigl in some scenes, acting as a second midfielder and relieving Weigl of complete responsibility. He would still move towards the right half-space, but stay on the line in front of the two centre-backs. The three-man defensive line was tailored towards Dortmund’s plan of passing through Leipzig’s pressure. 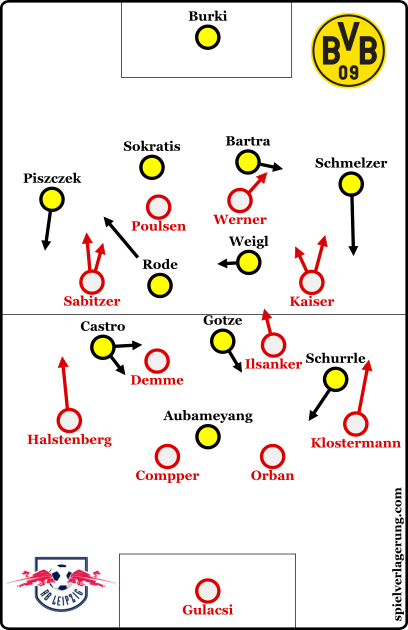 A common tactic against teams such as Leizpig and Leverkusen, they focused their circulation more in the half-spaces and wide areas and submitted control of the centre to their opponents. With a back three as their foundation, they looked to play aggressive vertical passes from both half-backs to initiate distinctly vertical combinations forward. Through a faster and more direct ball circulation, Dortmund had to better the intensity of the pressing movements of the hosts – something very difficult to do. Tuchel’s side most-often looked to progress through the half-spaces, where they played passes to one of Castro, Götze or Schürrle. Despite their struggles, they were able to find these players cleanly on a few occasions through direct vertical passes through the lines of Leipzig defenders. The wing-backs would both be looking to stretch Leipzig and occupy the near attacking midfielder, whilst the inside-moving Schürrle and Castro would appear in any gaps created whilst the ball was still with the defensive line. However Dortmund failed to create much past the initial vertical pass. There were some moments with fast combinations of 2-3 passes but meaningful attacks were a rarity throughout a game where Dortmund created just 0.5 expected goals. The recipient often struggled to receive the ball with a clean touch and then turn towards goal without being impeded by frantic pressure from the opponents. Leipzig’s defensive line defended well in such cases to snuff out any attacks before they could truly form, and Dortmund had a difficult time of imposing any threat in the final third. They were also held back to some extent by simple errors. The pressure of RBL is to be taken into account, but a number of heavy touches occurred in the midfield even when a defender wasn’t in the near vicinity. It resulted in a number of possessions breaking down and added to their difficulty in establishing controlled attacks. Despite their struggles, the Dortmund management didn’t attempt to make many changes after half-time. The ball circulation continued in a rather stale manner, moving from side-to-side around the outside of the RBL defensive block, who continued to control the game well through their pressing system. This issue was eventually amended to some extent through the introduction of Dembélé, whose individual trickery was effective in breaking through the pressing of an increasingly-fatigued Leipzig. In the end, a tight game was decided by Naby Keita, who finished a close-range attempt assisted by new-signing Oliver Burke. The hosts fully deserved their victory and controlled the game for large periods, as their pressing stopped Dortmund from developing many threatening plays. With Dortmund struggling and RBL certainly on the rise, the way the game played out wasn’t a great surprise. The most-hated club in Germany will soon become one of the best teams, too – this match was just a hint of what is to expect. Still, I guess Oliver Burke should’ve gone to Sunderland or Burnley. The High Pressure Strategy reminds me of Arigo Sacchi’s philosophy where they control the spaces, making it difficult for the opponent to build up from the back. Time and space are the most important aspects for any footballer. Devoid of them, the latter will almost always struggle, irrespective of how good he is. That is the key. To take the most dangerous players out of the equation. Plus Zonal Marking helps in reducing the spaces defenders might leave whenever chasing opponents in a Positional Play structure. Awesome, I have learned so much in this website. Looking forward for more articles. It looked like total anti-football to me, boring game and lots of aggressive fouls – the ref wasn’t that strict with his cards (not blaming him because of the defeat, but it’s a fact and it didn’t go into Dortmund’s account). Of course, hats off to Leipzig’s pressing and control of the game. Some subs should’ve come earlier, Dembele and Guerreiro in particular as they added a lot to Dortmund’s attack. I also can’t really follow the thought of subbing on Ramos. Perhaps Pulisic should’ve been brought up. Dembele had quite a few good dribbles, and Guerreiro was a bit pressing resistant as well. I’m sure Pulisic would add to that too. My opinion, and by no means am I an expert so correct me if I’m wrong – I always like to learn new things, is that you can hardly break through that hard press with a complicated structure, tactical little things and whatnot. You need quite a few good dribblers that will put the opponent’s press off-balance. Dortmund had a plan, and a plan, however good it is, can be worked against. Perhaps my opinion is a brute force example of football, but not every game plan can include only risk-free tactics. It doesn’t always work. Dortmund should’ve, IMO, made the whole game a bit more chaotic, being much more fluid with their positions and faster with the ball. That aside, it was clear how Dortmund’s game is still under heavy development. They also had a bad day, the midfielders were not really present nor particularly good. Dortmund really has problems against heavy pressing, but also against aggressive duels. One good point for Dortmund: Gotze was pretty decent, Guerreiro looked very promising, and Dembele just glides on the pitch with the ball. Also, I’ll sound like a commentator, but after Schurrle’s illogical miss, they got ‘punished’. Commentators here say it’s football’s unwritten rule – you miss a 1on1 chance to win the game, you concede and lose. Dembélé and Guerreiro should have come on earlier I agree. Dembélé is a high risk high reward player – either he changes the game for or against you by winning or losing loads of dribbles. The Picture “Dortmund’s unusual structure in build-up.” looks odd to me. Castro never really came that deep. He mostly stayed quite high up the pitch closer to Aubameyang than to Weigl. Also the “most hated club” in Germany already has 6 points and will be champion again next may. Some very loud people are making the impression of RBL widely hated among the fans – I don’t think the majority has a real opinion on it.